This morning, November 15, 2013, 25 years after Yasser Arafat declared independence of the Palestinian state, a group of Palestinian activists undertook a direct action against the annexation wall and fence, supported by both Israeli and international activists. Palestinian activist smashes annexation wall with a sledgehammer (photo by Ingrid Bousquet). 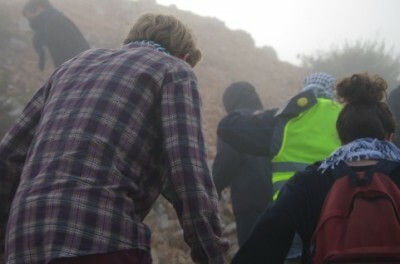 At approximately 6:30 am groups of Palestinian, Israeli and international activists traveled to a section of the annexation wall in Bir Nabala. Sledgehammers and other tools were donated by local popular committees and these were used to begin to smash through the wall. Palestinian activists gradually begin to break through (photo by Ingrid Bousquet). The action continued for approximately 20 minutes. The hole in the apartheid wall grows larger (photo by Ingrid Bousquet). 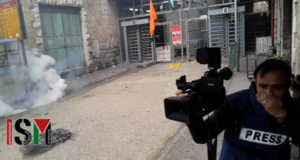 Israeli soldiers did not arrive and activists were able to leave the area without confrontation from Israeli forces, moving on to the second action in Rafat. Activists used donated wire cutters and bolt cutters to damage the annexation fence north west of Jerusalem. 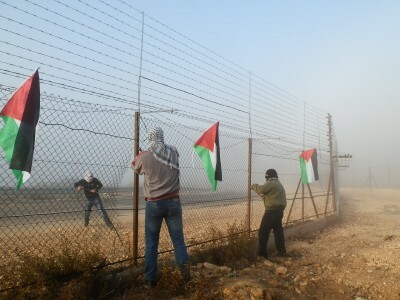 The fence is torn down by Palestinian activists (photo by ISM). Again, activists were able to successfully complete the action without intervention from Israeli forces. Activists leave the Rafat area (photo by Ingrid Bousquet). The apartheid wall and fence was declared illegal by the International Court of Justice in 2004, yet it continues to be used as a mechanism to contain and oppress Palestinians who live within its boundaries. The action today can be seen as a symbol of the resistance within Palestine especially as today marks the anniversary of the Palestinian declaration of independence. Although this statement was written and signed 25-years-ago, Palestine remains under control by Israeli forces, the annexation wall a constant reminder of this occupation.